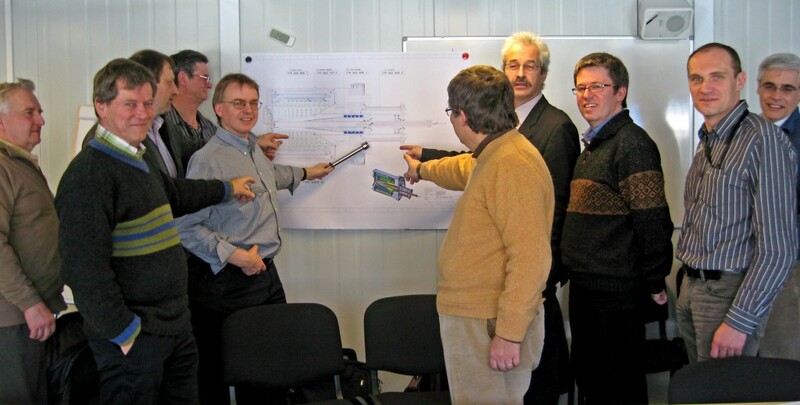 The ITER Vacuum Group and their colleagues from Barcelona discussing the ITER pre-production cryopump. To maintain a vacuum inside the ITER vacuum vessel and the surrounding cryostat, ten cryopumps will be needed. During plasma operation, the pumps will draw exhaust from the plasma in order to keep it clean and allow the fusion reaction to be sustained. The ITER cryopumps will be required to function in a fast cyclic mode—continuously pumping and recirculating the exhaust of the burning plasma, including the helium produced as a result of fusion. With such a specific mission to perform, a pre-production cryopump will be manufactured to test its functionality before the construction of all ten begins. In order to prepare the corresponding design work, a major meeting was held recently at the ITER site in Cadarche with the responsible officers from the European Domestic Agency and the manufacturing firm Forschungszentrum Karlsruhe (FZK). "The design is based on significant complex modelling," the leader of the Vacuum Section, Robert Pearce, explained. "But if it is proven to be good, the pre-production pump may even be used on ITER for the hydrogen start-up phase."